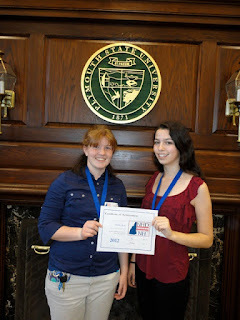 Two students from Exeter High School traveled to Plymouth State University on March 31st to compete with students from 14 school districts around the state for honors in the 9th annual New Hampshire History Day competition. The 2012 National History Day theme is “Revolution, Reaction and Reform.” The students, Chandra Boudreau and Ainsley Katz, both juniors, won First Place in the Senior Group documentary category for their film, “By Word and Sword: Revolutionary Reactions to Lincoln's Wartime Reform.” The film examined goals for the Emancipation's issuance, reactions from different groups in the North and South, and the enduring legacy of the document. Her partner, Ainsley Katz said, "We chose this topic because the complexity of the Emancipation Proclamation is often overlooked. Not only did the North have infighting over emancipation, but Lincoln himself struggled between his morality and his strong commitment to salvaging the Union." 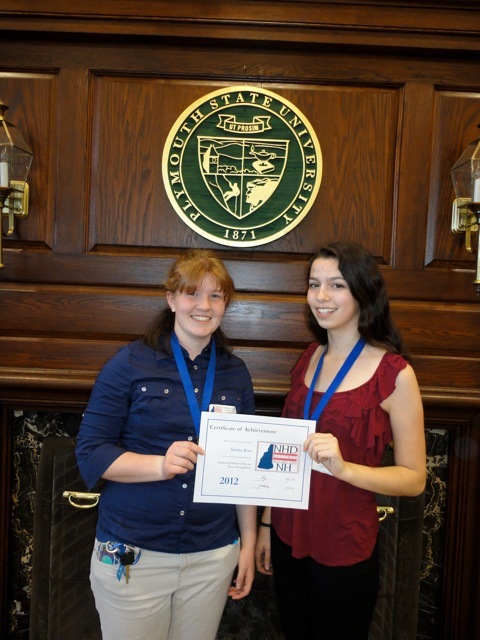 Photo:Exeter High School students Chandra Boudreau (left) and Ainsley Katz (right) win History Day in New Hampshire competition.